The next step in the ritual procedure is that of the Intention: the reason for doing the ritual. During the Intention the main body of the ritual is developed. For example, seasonal celebrations will focus on time honored themes such as planning, planting, harvesting, and remembering. Full moon rituals will concentrate on lunar themes, the feminine aspect of deity, or magical operations. This portion of the ritual is where individual creativity blossoms. 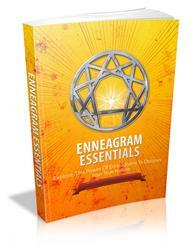 The intention can be as simple or elaborate as the practitioner wishes. 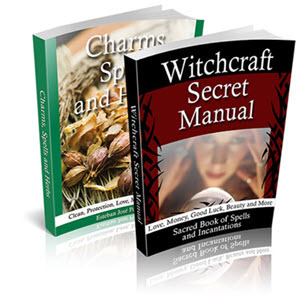 The solitary Witch will usually keep this portion of the ritual fairly simple, using a cherished poem or prayer to express his or her desires. The coven or large group might use this time for a guided meditation to present a drama based on a mystery teaching, or to participate in an activity like dancing around the Maypole. Whatever the activity is, it should be appropriate to the season and theme of the rite. The Rite of Union, the blessing of bread and wine, is a common act in most Wiccan and Mystery traditions. During this segment of the rite, wine and bread (or cake) are blessed and then shared among members in honor of deity. In most ceremonies the wine is symbolic of the blood, or life essence, of the God, and the bread (or cake) the body or energy of the Goddess. When the wine and bread are consumed by the participants of the ritual, they are spiritually transformed through the divine symbolic attributes of the food. Solitary Wiccans act out the Rite of Union as part of their rituals just as covens do. During the rite, the wine will be blessed, transforming it into the vital essence of the God. Once this process has been completed, the sacred fluid is poured into the chalice (the physical symbolic representation of the Goddess). The chalice is then conjoined with the athame (the physical symbolic representation of the God) to form the perfect union of masculine and feminine energy. The couple performing the Rite of Union will need a chalice, athame, and two containers of wine, one red and one white (red and white grape juice may be used as a substitute). One is filled with white wine, and the other with red wine. 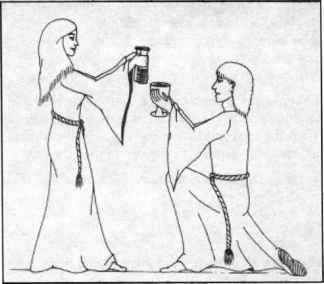 Lead Female (Priestess) pouring the wine into the chalice held by the Lead Male (Priest). white and one red. They then turn and face each other. She holds the wine as pictured and he kneels facing her, holding the chalice. I pour the red and the white, that they shall mix, as life and death, joy and sorrow, peace, and humility, and impart their essence of wonder unto all. For I am the father, lover, and brother unto all. The bringer of life, and the giver of death before whom all time is ashamed. Let my spirit breathe upon you and awaken the fires of inspiration within your soul. LF: For as this athame represents the male, and the God. LM: And this chalice represents the female, and the Goddess. Both: They are conjoined to become one, in truth, power, and wisdom. So Mote It Be. "Perfect love and perfect trust." Blessing bread takes on the same significance as does the blessing of wine. During the blessing, the vital essence of the Goddess is drawn down into bread or cake, making it sacred. The act of blessing the bread will again be done by the lead female of the group and the lead male. The bread will have been placed on a plate or on the pentacle before the ritual. (Small biscuits or common bread purchased from religious supply houses work best as they are small and made especially for religious rites.) As the Rite of Union comes to a close, LF and LM prepare to begin the blessing of the sacramental bread. Guardian of the souls of man who rises triumphant from the tomb. We give honor to thee, O sacrificed God Who through the Mother grants eternity. By shedding your blood upon the land, All are transformed through your passion As they pass through the gates of judgment. Let now the mystery be revealed Of the light of the Lord within, Who in the shadow of the Goddess Will ever reign supreme. So Mote It Be! As with the wine, the bread is passed among the members so each may receive a portion of the god's blessing. My Lady is the vessel through which all life flows. My Lady is birth and renewal. The moon holds it in darkness. In truth, power, and wisdom. The practitioner then takes a sip of the wine in honor of his or her god and goddess. O Great Lord of Heavenly power Whose presence reigns from above Be with me in this ritual hour And grace this bread with your love. So Mote It Be!